Frenchman Julian Alaphilippe wins on home turf Wednesday, beating two-time Paris-Nice champ Alberto Contador and taking the overall lead. With a nasty uphill kick to the line at Mont Brouilly, Paris-Nice’s stage 4 time trial favored the climbers, and Frenchman Julian Alaphilippe won on home turf Wednesday, beating two-time race winner Alberto Contador (Trek-Segafredo). With his win, Quick-Step’s Alaphilippe took the yellow leader’s jersey from sprinter and compatriot Arnaud Démare. Lotto-Soudal’s Tony Gallopin rode to third on the stage. Alaphilippe, 24, admitted after the race that he didn’t realize he was on track to win the stage. However, he said he was very motivated and the course was perfect for him with the fast start and tough climb at the end of the 14.5km test. He set the fastest time at the intermediate checkpoint and had no problem with the three-kilometer ramp that finished the course with an average gradient of 7.7 percent. Looking ahead, the Frenchman aims to defend the overall in a race he’s never won, although he said the final stages will be very difficult. Alaphilippe has won a week-long stage race before: In 2016, he was champion of the Amgen Tour of California. 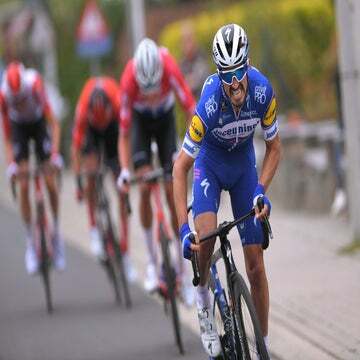 Despite having finished second at Liège-Bastogne-Liège, Flèche Wallonne, and a stage of the Tour de France, Wednesday’s victory was the first WorldTour win of Alaphilippe’s five-year-old career. “The yellow jersey represents so much in the cycling history, and I’m proud to wear it,” said Alaphilippe, the first Frenchman to win a time trial at Paris-Nice since Jean-François Bernard, 25 years ago. “Now I want to enjoy this great moment and then focus on helping Marcel in stage 5”, concluded Julian, the seventh different Quick-Step Floors rider to notch up a win in 2017. Thursday’s stage should give the overall contenders a day of respite with only two minor categorized climbs on the 199.5km route from Quincié-en-Beaujolais to Bourg-de-Péage.